Whistler's most exciting adventure! 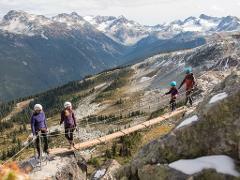 Experience this unique and exhilarating hiking and climbing excursion to the summit of Whistler Peak. "Via Ferrata" is Italian for "Iron Way". It is a vertical pathway with permanently fixed cables. A fun and safe climbing adventure with amazing views, for ages 8 and up. Hike up to and along the edge of Whistler Mountain overlooking amazing mountain views. You clip into a cable to safely cross small suspended bridges and cliff-edge features.